New Boston Metaphysical Society Story Update and More! I’ve finished the first draft of the new Boston Metaphysical Society story, Boston Metaphysical Society: The Spirit of Rebellion. Like Scourge, it will be a standalone continuation of the original series, but will feature Caitlin O’Sullivan. Samuel will be there too, but in a smaller roll. Gwynn is on board to do the art and I expect to launch a campaign for it early next year. The first novel in this universe, Boston Metaphysical Society: A Storm of Secrets will be out in October. I will be running a giveaway for all newsletter subscribers that month for pdf and print copies. I’ll share the cover once it’s ready. The other series I’m writing for SFC Comics/Evoluzione Publishing, Kasai: The Homecoming just received it’s first review and I was pretty happy with it. You can read it here. If you missed the Kickstarter for Issue #1, digital copies will be available on Comixology soon and print copies once they have been sent to Kickstarter backers. They will also be running a Kickstarter in November for Issue #2. 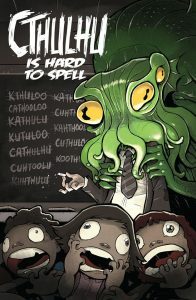 I wrote a very fun short story for the Cthulhu is Hard To Spell Anthology called, The Marriage Counselor. MJ Massy is the artist. This is going to be an amazing anthology and you can download a 95 page preview for free here. This Kickstarter will launch Sept. 4, so keep an eye out for it.